Ohio Wal-Mart Runs Thanksgiving Food Drive For Employees : The Two-Way Critics say it proves the Arkansas-based retailer doesn't pay enough, but the company says it's just proof that workers care about each other. 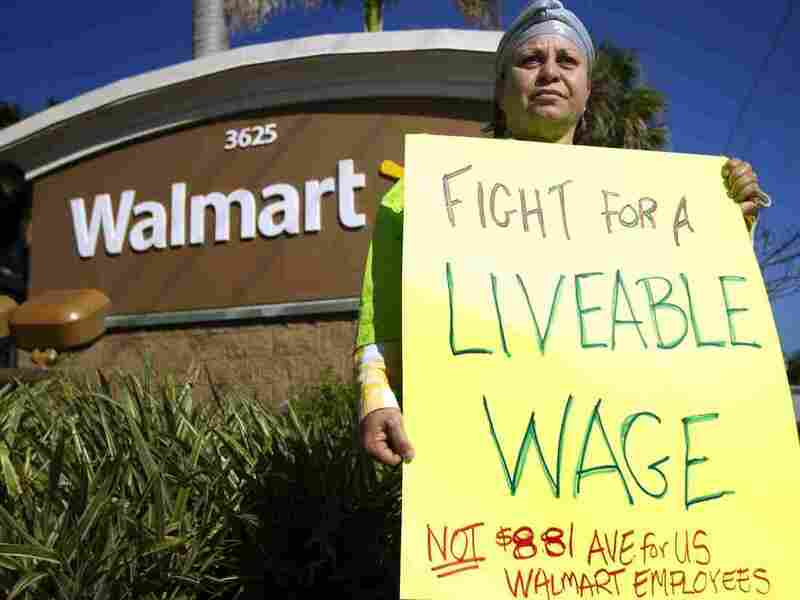 A woman in Boynton Beach, Fla., who took part in a nationwide protest against Wal-Mart last November. A Wal-Mart in Canton, Ohio, thought it was doing something good when it set up a Thanksgiving food drive this year for some of its needier employees. A series of plastic storage bins in an employee-only section of the store with a sign reading "Please donate food items so associates in need can enjoy Thanksgiving dinner" prompted The Cleveland Plain Dealer to ask: "Is the food drive proof the retailer pays so little that many employees can't afford Thanksgiving dinner?" The newspaper quotes Norma Mills of Canton, who lives near the store and saw a photo of the food bins. At first, she said, she felt "outrage" and "anger." "Then I went through the emotion of compassion for the employees, working for the largest food chain in America, making low wages, and who can't afford to provide their families with a good Thanksgiving holiday," said Mills, an organizer with Stand Up for Ohio, which is active in foreclosure issues in Canton. "That [Wal-Mart] would have the audacity to ask low-wage workers to donate food to other low-wage workers — to me, it is a moral outrage." Others have also taken note of the apparent irony of the employee food drive at a company that's been in the national spotlight for its supposed lack of liveable wages. The Atlantic says, "One might be tempted to take this as a sign that the country's largest retailer (and grocer) doesn't pay their workers enough to put a holiday meal on the table." Wal-Mart spokesman Kory Lundberg says the food drive is just proof that employees care about each other. "It is for associates who have had some hardships come up," he said. "Maybe their spouse lost a job. "This is part of the company's culture to rally around associates and take care of them when they face extreme hardships," he said. "Quite frankly, a lot of people in that store are frustrated and offended that this is reported in a way besides other folks rallying around each other," Lundberg said, according to AkronNewsNow.com, adding that last year, 12 people had been helped by this very program in the store. "I couldn't be prouder of people in that store helping in a tough situation," he said. Last year, several hundred to perhaps 1,000 workers (depending on whether it's Wal-Mart or activists doing the counting) turned out for a "Black Friday" to protest the company's wages and working conditions. And in June, protesters, including some striking workers, disrupted Wal-Mart's annual shareholders' meeting.